Sign up with our easy four-step process. Retake the test as many times as needed to pass. Please print the Forklift Authorization Form to take to your employer to complete your Forklift Certification and Training. It is the companies responsibility to observe you on the equipment. If the kit is being mailed to you, an additional $15 dollar shipping charge will apply. Fun and easy! No textbooks or boring lectures. Training for scissor lifts, extensible boom platforms, articulating boom platforms, etc. Seeking Online Certifications so you can earn a better living as a forklift operator or a forklift trainer? Need to train your staff so that they stay safe on the job and comply with OSHA requirements? A-1 Forklift Certification has more than 30 combined years' experience in warehouse management, training and forklift operation. Based in Anaheim, California, we offer a variety of courses to businesses and individuals. A-1 Forklift Certification will conduct hands-on OSHA-compliant training at your business and customize our courses to suit your company's needs and regulations. We train groups of any size of all levels of experience, from the beginner forklift operator to the advanced. A-1 Forklift Certification provides onsite forklift training to businesses throughout Southern California including Los Angeles, Riverside, San Bernardino and Orange counties. Learn from fun instructors who won't bore you or your staff! Receive expert training on all relevant Federal and State Safety Standards and Regulations with hands on OSHA compliant forklift training. All students who take ourhands-on certification courses can work toward receiving their Forklift Operator Card and receive their Forklift Operator Certificate the same day! Our Train the Trainer package comes with all of the necessary materials to help you conduct your own in-house forklift training courses. If you're an individual living in another part of the U.S., we offer affordable, trusted Online Certifications and training. Our process is simple. Work at your own pace, print out your certificate and receive your Forklift Operator Cards, including Aerial Boom Lift Authorization, Scissor Lift Authorization, Forklift License, and more via mail within three to five business days. Certified! Many people seeking employment have no idea how powerful this word is. But when you're a certified forklift operator, you'd be amazed by how many doors can open for you. At A-1 Forklift Certification, we help you take the next step in your career and increase your chances of gaining job stability. While we can help you to get the training and certification you need to advance in the workplace, what you also need is dedication, an excellent attitude, a strong work ethic and follow through. If you take our online forklift certification course, you can work at your own pace. Our Train the Trainer course will help you to embark on entirely new career path as a leader in the field. Our hands-on courses help you to get certifed the same day. Are you local to the Anaheim area? 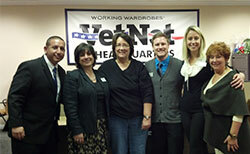 If so, we can even put you in touch with hiring agencies who'll help you seek employment. Looking for onsite forklift certification in Los Angeles, Riverside, San Bernardino and Orange counties? A-1 Forklift is a total solutions provider of forklift training throughout Southern California. Contact us today. We will come to you. Earn a better living. Start a new career. 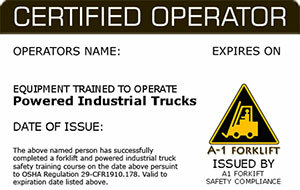 Get started with A-1 Forklift Certification today. 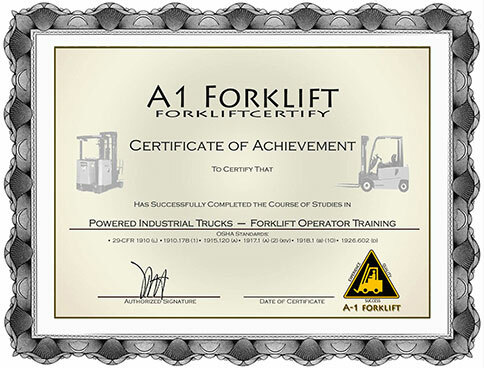 Based in Anaheim, California, A-1 Forklift Certification provides high-quality online forklift certification, on-site courses, hands-on training, aerial lift training and train-the-trainer courses. Our team has more than 30 years' experience in forklift operation and warehouse management. Earn a better living. Start a new career. Ensure optimal workplace safety. Let us help you to comply with OSHA regulations and get certified. Shop now.